When it’s so hot your skin feels like it’s boiling and the air conditioner seems to be giving up on working, your only goal is to cool down. It’s easier to do in the evenings when the sun isn’t up, but you still have to make it through the day. One major obstacle is keeping your drinks cool while it’s still light out. The sun has a nasty habit of warming all it touches, and a forgotten beverage is sure to become warm in no time. Of course, some drinks are rather unpalatable if above a certain degree, which is why you need to make sure you’re putting it in the right container. 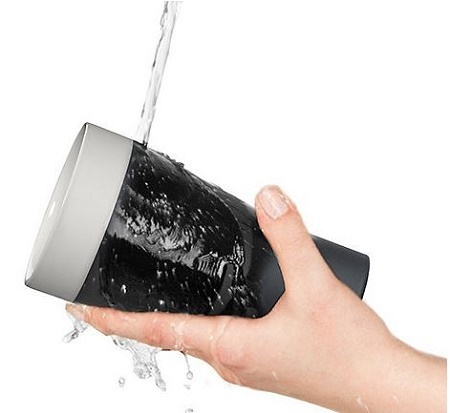 This Terra Cotta Tumbler will help you keep your drink chilly for hours, and you only need to soak it in water for it to work. The exterior is black and coarse, so you can easily write on it with chalk. This would be a perfect way to know which drink belongs to who without any confusion. Paying $40 will get you a set of two of these, which won’t be enough for a full-fledged party, but would be ideal for hanging out with a significant other or friend. Of course, you can always keep one soaking while the other is in use so there’s always a replacement waiting for when the water evaporates. It is a bit expensive considering these are just tumblers, but there’s nothing to charge or batteries to deal with as you only need to set it in water for 90 seconds so it can become 40% cooler than ambient temperature. Avengers: Age of Ultron Captain America Shield Backpack – make sure Black Widow does not pick up after you!